Purpose: With the introduction of photosensitive (light-activated) restorative materials in orthodontics, various methods have been suggested to enhance the polymerization of the materials used, including use of more powerful light curing devices. Bond strength is an important property and determines the amount of force delivered and the treatment duration. Many light-cured bonding materials have become popular but it is the need of the hour to determine the bonding agent that is the most efficient and has the desired bond strength. Aim: To evaluate and compare the shear bond strengths of five different orthodontic light cure bonding materials cured with traditional halogen light and low-intensity light-emitting diode (LED) light curing unit. Materials and Methods: 100 human maxillary premolar teeth, extracted for orthodontic purpose, were used to prepare the samples. 100 maxillary stainless steel bicuspid brackets of 0.018 slot of Roth prescription, manufactured by D-tech Company, were bonded to the prepared tooth surfaces of the mounted samples using five different orthodontic bracket bonding light-cured materials, namely, Enlight, Fuji Ortho LC (resin-modified glass ionomer cement), Orthobond LC, Relybond, and Transbond XT. 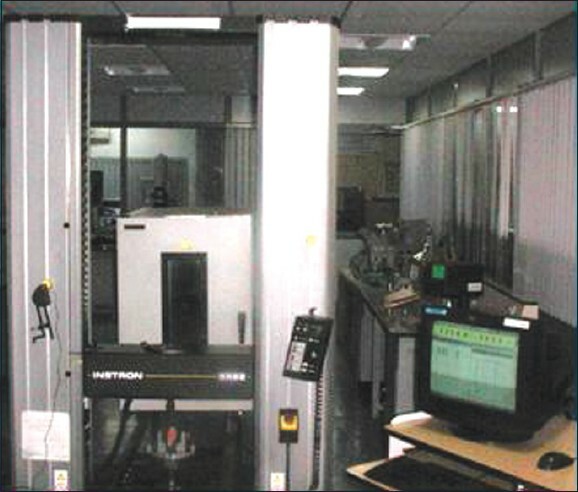 The bond strength was tested on an Instron Universal testing machine (model no. 5582). Results: In Group 1 (halogen group), Enlight showed the highest shear bond strength (16.4 MPa) and Fuji Ortho LC showed the least bond strength (6.59 MPa) (P value 0.000). In Group 2 (LED group), Transbond showed the highest mean shear bond strength (14.6 MPa) and Orthobond LC showed the least mean shear bond strength (6.27 MPa) (P value 0.000). There was no statistically significant difference in the shear bond strength values of all samples cured using either halogen (mean 11.49 MPa) or LED (mean 11.20 MPa), as the P value was 0.713. Conclusion: Polymerization with both halogen and LED resulted in shear bond strength values which were above the clinically acceptable range given by Reynolds. The LED light curing units produced comparable shear bond strength to that of halogen curing units. Bond strength is an important consideration for the bonding of brackets to teeth. Shear bond strength depends on various factors including the adhesive properties of the bonding materials, the attachment at the different interphases like the tooth to composite interphase and the composite to bracket interphase, as well as the polymerization of the composite bonding material. Bond strength determines the amount of force delivered and also affects the treatment duration. 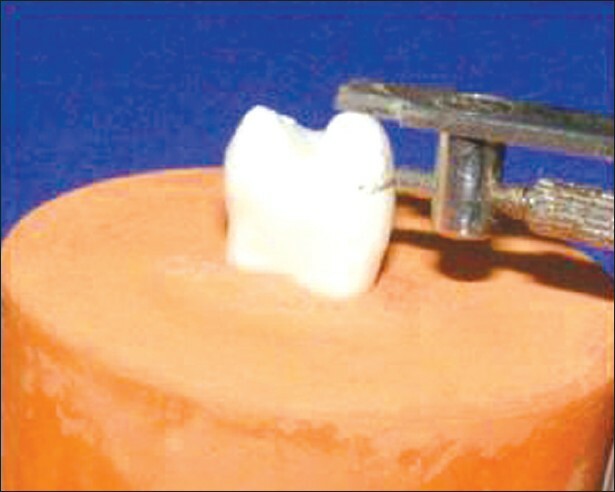 There was therefore a constant quest to improve the bond strength of orthodontic bonding agents. This paved the way to improve the strength of the interphase between the composite to tooth and composite to the base of the bracket. To overcome the several drawbacks of halogen curing light units, Light-Emitting Diode (LED) technology was introduced by Mills et al. in 1995. It generates appropriate wavelength and curing cycles. The LED has distinct advantages when compared with halogen bulbs. Previous studies  have shown that blue LEDs have the potential to polymerize dental composites without having the drawbacks of halogen light curing units. It has been reported  that dental resins cured with blue LEDs have a higher degree of polymerization and a more stable three-dimensional structure than those cured with halogen lamps. It is therefore important to evaluate the shear bond strength of bonding materials polymerized using the LED curing units. Therefore, at such a time when various light curing units and bonding agents, claiming to possess the best of properties, have flooded the markets, a need was felt to evaluate and compare the shear bond strengths of orthodontic brackets attached with four light-activated composite resins and a resin-modified glass ionomer cement (GIC) polymerized using two different types of low-intensity halogen lights and LED curing units. Halogen light curing unit: "QHL 75 Lite", model no. 502, Dentsply Corporation, Milford, USA, with a light intensity of 450 mW/cm2. One hundred maxillary stainless steel orthodontic bicuspid brackets of 0.018 slot of Roth prescription, manufactured by D-tech Company (USA), were used. All bracket bases had mesio-distal and occluso-cervical contour and 80-gauge foil mesh grid with single-layer mesh configuration. The total surface area of each bracket base was 11.56 mm. The sample consisted of 100 human maxillary premolar teeth which were extracted for orthodontic purpose and stored in 10% formalin solution at room temperature to prevent dehydration till experiment. Before bonding, the teeth were removed from the formalin solution and washed thoroughly in distilled water to eliminate any formalin sticking to the tooth surface which could interfere with the bonding. 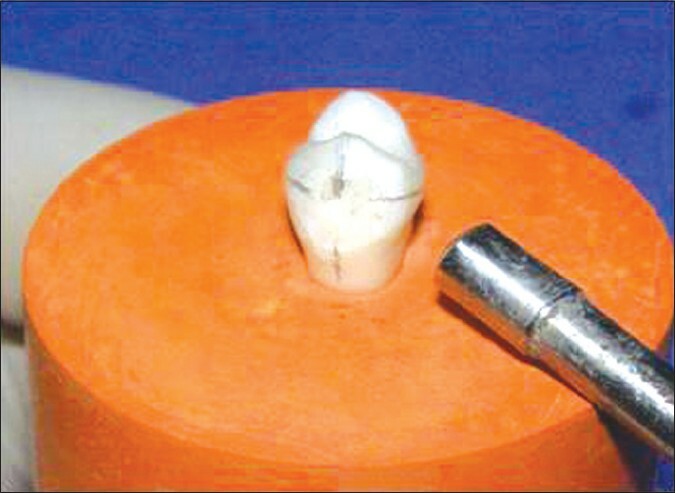 The cleaned teeth were then mounted separately in a circular block of 3 cm diameter and 3 cm height in a die stone ((Ultrabase, Kalabhai, India) so that it could properly be seated on the testing machine. All the mountings were made in such a way that the teeth mounted upright and only the root portion was embedded in stone while the crown portion was fully exposed above the stone to facilitate proper positioning of the bracket on labial surface [Figure 1]. All the specimens were kept in distilled water except during the bonding and testing procedure. Before bonding, the buccal surfaces of the teeth were cleaned with non-oily pumice powder in water using a rotary rubber cup at slow speed (25,000 rpm) to ensure removal of any dirt\calculus\deposits or stains. All teeth were dried with oil and moisture-free compressed air. The exact position of the bracket on the tooth was marked with a Boon's gauge  having 0.5 mm HB lead pencil point [Figure 2]. On all the specimen teeth, the center of the labial surface of the crown was marked vertically with the lead pencil. The horizontal markings were made at 4 mm from the tip of the labial cusp by using Boon's gauge. 37% buffered orthophosphoric acid gel (Dental Products of India, Mumbai, India) was applied with a sponge microtip applicator on 4 mm 2 area marked for bracket positioning. After 30 seconds, the etching solution was washed out with distilled water/spray combination for 20 seconds and then dried with oil-free compressed air [Figure 3] until a characteristic frosty white etched area was observed. Latex gloves were worn throughout the procedure to prevent contamination. A thin, uniform coat of primer was painted gently with a nylon brush to the etched area of each tooth. Then using a syringe tip, the bonding material was dispensed on to the base of the bracket. The material was firmly spread over the entire base. The resin-modified GIC (Fuji Ortho LC), supplied in the form of a powder and liquid separately, was dispensed on the mixing pad at 1:1 proportion and mixed with a plastic agate spatula for 45-60 seconds, then the mixed cement was placed onto the bracket base. The bracket was placed directly on the tooth surface and then pressed firmly to the desired position [Figure 4]. Excess adhesive from edge of the bracket was removed with a sharp scaler. Group 1: A total of 50 specimens (subgroups A-E) were cured with halogen light curing unit (Dentsply Corporation) for 40 seconds (20 seconds on the mesial and 20 seconds on the distal surface of each bracket). 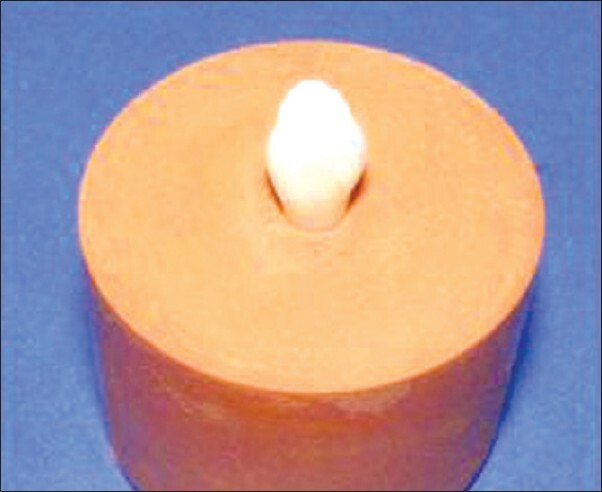 It contains quartz and tungsten filaments in an incandescent lamp that produces a broad spectral emission of 400-500 nm. Group 2: A total of 50 specimens (subgroups F-J) were cured with Hilux LED for 20 seconds (10 seconds on the mesial and 10 seconds on distal surface of each bracket). Hilux LEDMAX 450 LED is an electrically operated semiconductor for the production of light in a narrow spectrum of 450-490 nm. The light-tip distance  from the mesial or distal surface of the bracket was kept at 3 mm and standardized using a graph paper marked at 3 mm [Figure 5]. It was fixed to the tip of the curing unit with the help of a 21-gauge orthodontic wire. During polymerization, the wire with the graph paper was kept touching a line marked on the tooth coinciding with the edge of the bracket. The recorded values were then tabulated systematically and subjected to statistical analysis by using mean, median, standard deviation, Student's "t" test, and Analysis of Variance (ANOVA) to determine statistical significance in difference in bond strength. Within the halogen group (Group 1), the shear bond strength values of samples using different bonding adhesives when compared statistically (P value 0.000) showed significant difference, with Enlight showing the highest shear bond strength (16.4 MPa) and Fuji Ortho LC showing the least bond strength (6.59 MPa). When the shear bond strength values of samples using different bonding adhesives were compared statistically within the LED group (Group 2), the observation showed statistical significance (P value 0.000). Transbond showed the highest mean shear bond strength (14.6 MPa) and Orthobond LC showed the least mean shear bond strength (6.27 MPa). Shear bond strengths of two bonding materials, Enlight and Fuji Ortho LC, cured with halogen and LED curing units, when statistically compared, did not show any significant difference (P values 0.071 and 0.052, respectively). It means both the materials showed the same shear bond strength with halogen curing and LED curing units. There was statistically significant difference in the shear bond strength values of samples using Relybond and Transbond XT when cured with halogen (11.31 and 12.47 MPa, respectively) or LED (14.12 and 14.62 MPa, respectively). Curing with LED gave better shear bond strength, with P values being 0.001 and 0.002, respectively. There was statistically significant difference in the shear bond strength values of samples using Orthobond LC when bonded with halogen or LED. Curing with halogen showed better shear bond strength (10.63 MPa) than curing with LED (6.27 MPa), with the P value being 0.000. Shear bond strength of resin-modified GIC (Fuji Ortho LC) when cured with halogen curing light and also with LED showed very low shear bond strength (6.59 and 7.49 MPa, respectively). This is within the range of the desired shear bond strength, but on a lower side. There was no statistically significant difference in the shear bond strength values of all samples cured using either halogen (mean 11.49 MPa) or LED (mean 11.20 MPa), as the P value was 0.713. 0Halogen bulb based light curing units, though most widely used, have some drawbacks such as reduction in light output due to degradation of the bulb, reflector and filter and a limited lifetime of 40-100 h due to the high operating temperatures. This reduces the degree of polymerization and leads to a decrease in the shear bond strength of the cured materials. LED technology, introduced by Mills et al. in 1995, provided distinct advantages of a longer lifetime of about 10,000 h and less reduction in output during this period when compared with halogen bulbs. LEDs use junctions of doped semiconductors (p-n) to generate narrow spectrum of blue light of 465 nm and hence require no filters. Their relatively low power consumption and resistance to shock and vibration makes them suitable for portable use. These better qualities of LEDs compared to halogen bulb technology show promise for clinical orthodontics. 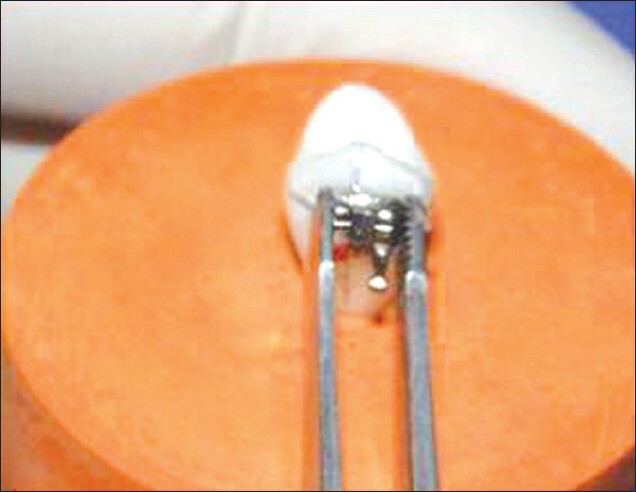 The study was designed to comparatively evaluate the shear bond strength values of five different bonding materials used to bond orthodontic brackets to teeth after being cured with LED and halogen lights, out of which four were composite resin materials and one was light-polymerized GIC. Demineralization and loss of fluoride from the tooth results from loss of surface enamel during bonding composite resins. A bonding material that could make the tooth structure more resistant to caries, yet retain bonding strength and properties of composite resins without the loss of enamel, would be the material of choice for bonding and one such potential dental adhesive is the GIC. It serves as a reservoir of fluoride ions that protect against decalcification. It claims to provide good shear bond strength and is also easier to remove than the traditionally used composite resins. Therefore, in the present study, a GIC (Fuji Ortho LC) was also selected along with the other composite resin bonding materials. Shear bond strength also depends on the duration of light exposure. An exposure time of 40 and 20 seconds was chosen for halogen and LED curing, respectively, as Usumez et al. suggested 20 seconds of LED exposure might yield shear bond strength comparable with that obtained with halogen unit in 40 seconds. 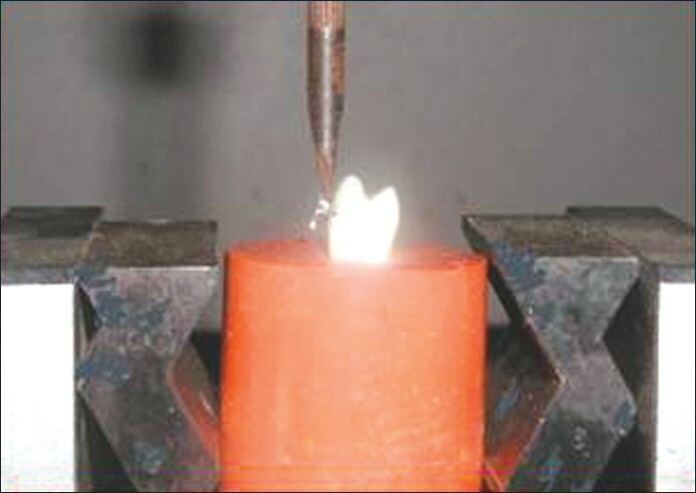 It was also chosen to use lower-intensity light curing units of 450 mW/cm 2 as, though the high-intensity curing units provide the advantage of faster polymerization, according to Ilie et al.,  curing with high-intensity units induces high polymerization stresses which weaken the bond to tooth structure. With low-intensity curing, there is a decrease in the number of free radicals released and this increases the viscosity by extending the pre-gel state, allowing time for the material to undergo some flow before the polymer network reaches the gel stage, and thereby reducing the stress buildup at the tooth-bonding agent interface. Higher-intensity curing units have also been reported to cause pulpal injury,  which was found to be less with LED curing units as compared to the halogen curing units. The light tip was held at a distance of 3 mm from the bracket and was standardized using an orthodontic wire holder with a graph paper with 3 mm marking kept extending from the light tip, as previous studies by Oyama et al.,  Lindberg et al.,  and Cacciafesta et al. suggested that 0 mm distance of the light tip from the bonding surface produced the highest light intensity, which produced maximum rise in pulpal temperature, and at 0-3 mm distance there was insignificant rise in pulpal temperature. There was a statistically significant difference (P=0.000) in the shear bond strength values of samples using different bonding adhesives within the LED group too. Transbond XT showed the highest bond strength (14.6 MPa); the bond strengths of other adhesives were Enlight (13.50 MPa), Fuji Ortho LC (7.49 MPa), Relybond (14.12 MPa), and Orthobond showed the lowest bond strength (6.27 MPa). The probable reason for the lowest shear bond strength for the Orthobond LC could have been the chemical composition of the composite resin material which may have been less compatible to the wavelength  of the LED curing unit and therefore resulted in a lower degree of conversion and thereby a lower shear bond strength. Student's "t " test was used in this study to compare the bond strengths of materials in the two groups cured with the halogen and LED curing units. Enlight and Fuji Ortho LC did not show any statistically significant difference (P values being 0.071 and 0.052, respectively) in the shear bond strength on curing with either halogen (16.44 MPa and 6.59 MPa, respectively) or LED light (13.50 MPa and 7.49 MPa, respectively). Relybond and Transbond XT bonding materials, when cured with LED, gave better shear bond strength values (14.12 MPa and 14.62 MPa, respectively) than when cured with halogen light curing unit (11.31 MPa and 12.47 MPa, respectively), the P values were 0.001 and 0.002, respectively. Orthobond bonding material, when cured with halogen and LED, and compared statistically, showed highly statistically significant results. Shear bond strength achieved with halogen light was better (10.63 MPa), whereas the same was low with LED (6.27 MPa) (P value 0.000). This indicates that halogen light gives better shear bond strength than LED light. The probable reason for this result could have been the chemical composition of the composite resin material which would have been more compatible to the wavelength of the "QHL-75 Lite" halogen light curing unit. All materials used in the study produced mean shear bond strength above the minimum value suggested by Reynolds  for a clinically effective orthodontic bond of 5.9-7.8 MPa, which suggests that all the materials tested can be clinically acceptable for bonding brackets to teeth. However, Fuji Ortho LC and Orthobond gave shear bond strengths very much on the lower side. Student's "t" test done to statistically compare the shear bond strengths of samples cured using halogen light and the shear bond strengths of samples cured using LED showed that there was no statistically significant difference in the shear bond strength values of samples cured using either halogen or LED, with the P value being 0.713, which is not significant. This result is in accordance with the results of many previous studies such as those of Cacciafesta et al.,  Dunn and Taloumis,  and Usumez et al.,  wherein halogen and LED curing units were compared for the shear bond strength and it was found that LED curing units produced comparable bond strengths in a lesser exposure time. The insignificant difference in the shear bond strength values between the halogen and LED light, considering the difference in the exposure time, can be explained as a difference in the spectral distribution of the two. Halogen curing units contain quartz and tungsten filaments in an incandescent lamp that produces a broad spectral emission of 400-500 nm. Much of this is infrared energy that generates heat, and therefore the lamp becomes extremely hot. Because of this heat generation, there is a power loss of 70% and less than 1% of the electrical energy is used for light emission. In addition, the light intensity decreases to 10% when a filter is used to reduce infrared energy and to obtain the optical wavelength range required for curing composite resin. Due to a wider spectrum of the light waves produced, a small amount of the light emitted is actually absorbed by the camphoroquinone which is the photoinitiator in most of the composite resins. The bulb, reflector and filter degrade over time due to high operating temperatures produced, leading to reduction in light output. This reduces the effectiveness of polymerization of composite restorative materials. The solid-state LED technology was proposed for the polymerization of light-activated dental materials to overcome the shortcomings of halogen visible light curing units. LEDs use doped semiconductors for the production of light in a narrow spectrum of 450-490 nm unlike the halogen curing units, and therefore do not get heated up. About 95% of the light beams from an LED are absorbed by the photoiniator (camphoroquinones) as the wavelength of the blue light spectrum emitted from an LED is about 465 nm which is very close to the maximum absorptive range of camphoroquinone which is 470 nm. Therefore, the polymerization requires less exposure time, as well as the depth of cure obtained is comparable to that obtained with a greater exposure time of the halogen curing. The laboratory assessment cannot predict clinical performance fully. As oral conditions are difficult to simulate in the laboratory, the results obtained should be interpreted with caution in the clinical practice and further clinical studies are necessary for validation. Also, it has been seen that there is significant difference in the output for various manufactured lights, including the range of the wavelength of the light produced. Light sources also generate different light intensities over time depending on the quality and age of the lamp. These differences can create a lot of variation in the results obtained in various studies. Evaluating bond strength is a sensitive experimental procedure and the same bonding materials can yield different results due to variations in experimental conditions. Newer technologies like the LED are slowly replacing the traditional halogen bulbs. The LED provides similar bond strength, depth of cure, etc. to that of the halogen curing units, in a shorter period of time, while providing other benefits like a longer lifetime and being user-friendly. Statistical analysis of the shear bond strength of samples cured using halogen light and with LED light showed that there was no statistically significant difference in the shear bond strength. Polymerization of the five different orthodontic bonding agents with both halogen and LED resulted in shear bond strength values which were above the clinically acceptable range given by Reynolds. The LED light curing units can therefore be called a viable alternative to the halogen curing units. 1. Newman GV. Bonding plastic orthodontic attachments to tooth enamel. J New Jersey Dent Assoc 1964;34:581-4. 2. Mills RW, Jandt KD, Asworth SH. Dental composite depth of cure with halogen and blue light emitting (LED) technology. Br Dent J 1999;186:388-91. 3. Kurachi C, Tuboy AM, Magalhaes DV, Bagnato VS. Hardness evaluation of a dental composite polymerized with experimental LED based devices. Dent Mat 2001;17:309-15. 4. Reynolds IR. A review of direct orthodontic bonding. Br J Orthod 1975;2:171-8. 5. Garn NW. Direct bonding: A clinical study using an ultraviolet sensitive adhesive system. Am J Orthod 1976;69:455-63. 6. Sheykholeslam Z, Brandt S. Some factors affecting the bonding of orthodontic attachments to tooth surface. J Clin Orthod 1977;11:734-43. 7. Brown CR, Way DC. Enamel loss during orthodontic bonding and subsequent loss during removal of filled and unfilled adhesives. Am J Orthod 1978;74:663-71. 8. Thanos CE, Munholland T, Caputo AA. Adhesion of mesh-base direct bonding brackets. Am J Orthod 1979;75:421-30. 9. Maijer R, Smith DC. Variables influencing the bond strength of metal orthodontic bracket bases. Am J Orthod 1981;79:20-34. 10. Cacciafesta V, Sfondrini MF, Scribante A, Brinkmann PG, Boehme A. Effect of light tip distance on the shear bond strength of composite resin. Angle Orthod 2004;75:386-91. 11. Buzzita VA, Hallgren SE, Powers JM. Bond strength of orthodontic direct bonding cement bracket systems as studied in vitro. Am J Orthod 1982;81:87-92. 12. Smith DC, Maijer R. Improvements in bracket base design. Am J Orthod 1983;83:277-81. 13. Cook PA, Youngson CC. A fluoride-containing composite resin: An in vitro study of a new material for orthodontic bonding. Br J Orthod 1989;16:207-12. 14. Sonis AL, Snell W. An evaluation of a fluoride releasing visible light activated bonding system for orthodontic bracket placement. Am J Orthod Dentofacial Orthop 1989;95:306-11. 15. Usumez S, Buyukyilmaz T, Karaman AI. Effect of light emitting diode on the bond strength of orthodontic brackets. Angle Orthod 2004;74:259-63. 16. Ilie N, Felton K, Trixner K, Hickel R, Kunzelmann KH. 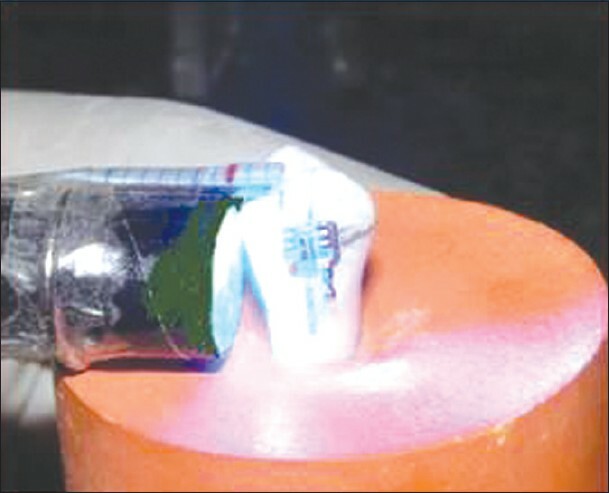 Shrinkage behaviour of a resin based composite irradiated with modern curing units. Dent Mater 2005;21:483-9. 17. Ozturk B, Ozturk AN, Usumez A, Usumez S, Ozer F. Temperature rise during adhesive and resin composite polymerization with various light curing sources. Oper Dent 2004;29:325-32. 18. Oyama N, Komori A, Nakahara R. Evaluation of light curing units used for polymerization of orthodontic bonding agents. Angle Orthod 2004;74:810-5. 19. Lindberg A, Peutzfeldt A, Dijken JW. Effect of power density of curing unit, exposure duration and light tip distance on composite depth of cure. Clin Oral Investig 2005;9:71-6. 20. Fox NA, McCabe JF, Gordon PH. Bond strength of orthodontic bonding materials: An in vitro study. Br J Orthod 1991;18:125-30. 21. Komori A, Ishikawa H. Evaluation of a resin-reinforced glass ionomer cement for use as an orthodontic bonding agent. Angle Orthod 1997;67:189-96. 22. Conrad CC, Staley RN, Jakobsen J. Bond strengths of a resin-modified glass ionomer with five orthodontic brackets. J Clin Orthod 2000;34:286-9. 23. Cacciafesta V, Sfondrini MF, Brinkmann PG, Boehme A. Light emitting diode technology for orthodontic bonding. J Clin Orthod 2002;36:461-5. 24. Dunn WJ, Taloumis LJ. Polymerization of orthodontic resin cements with light emitting diode curing units. Am J Orthod Dentofacial Orthop 2002;122:236-41. 25. Layman W, Koyama T. A clinical comparison of LED and halogen curing units. J Clin Orthod 2004;38:385-7. 26. Bishara AE, Ajlouni R, Oonsombat C. Evaluation of a new curing light on the shear bond strength of orthodontic brackets. Angle Orthod 2003;73:431-5. 27. Soh MS, Yap A, Siow KS. Effectiveness of composite cure associated with different curing modes of LED lights. Oper Dent 2003;28:71-7. 28. Turkkahraman H, Kucukemen C. Orthodontic bracket shear bond strengths produced by two high power light emitting diode modes and halogen light. Angle Orthod 2004;75:854-7.